Here is another one of our favourite recipes to experience the leftovers in a different a way. This delicious meat pie recipe was given to me by a family friend several years ago. Yummy! Sautè green pepper and onions in butter or olive oil. Add the balance of the filling ingredients. Pour into shell and top with second pastry for top crust. Bake at 425 for 15 minutes and then at 350 for 20 to 30 minutes. (Place foil or a cookie sheet below the pie plate in case it runs over.) If you want to freeze the pie, don’t bake it prior to freezing. Thaw before baking. I made my pie last night, but the picture is hardly worth posting, as I decided to freeze it and have it in a week or two. 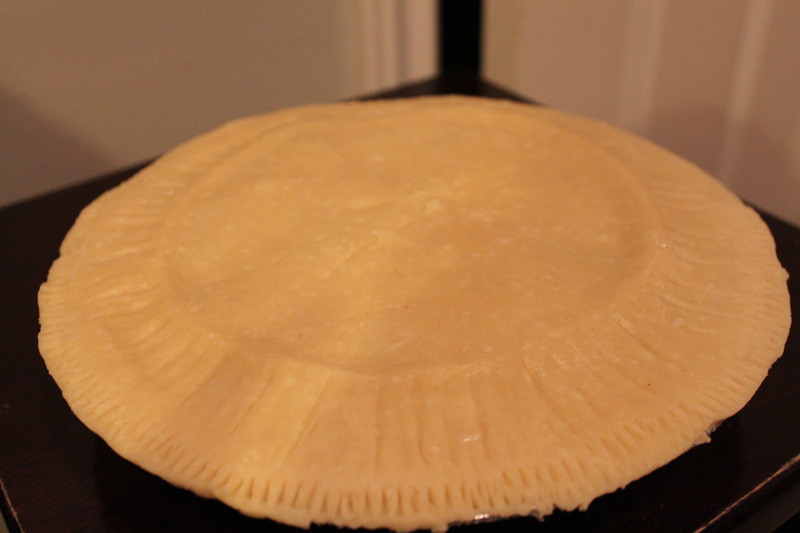 I used frozen shells, so the top crust looks a bit funny, but it will be fine once it’s cooked. Mmmm….something to look forward ~ an easy and delicious meal that is ready to go in the oven. Gotta love that! Posted on October 16, 2013 by Cindy Roy •	This entry was posted in Main Course, Recipes. Bookmark the permalink. Oh yum, this sounds delicious. Wish I was at your house when you’re serving it.